Lewis Stevenson has revealed the methods adopted by new boss Paul Heckingbottom which have had a positive effect on the Easter Road club. This is the tenth manager that Stevenson has worked under since he first broke into the first-team squad under Tony Mowbray in 2005 and he’s been impressed by his new gaffer’s attention to detail. 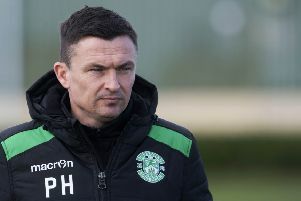 After replacing Neil Lennon, who left the club after being suspended in late January, Heckingbottom oversaw an immediate upturn in results with three successive wins, which propelled the side into the top half of the league, before tasting his first defeat with a Scottish Cup exit at the hands of Celtic last Saturday. This improvement has been aided by the use of statistics and video analysis, as Heckingbottom looked to improve upon the structure of the team and hold the players more accountable for their own individual effort. Stevenson said: “He looked at videos of games before and he thought we looked a bit ragged and that has been proved in the last four games, we have kept a good shape. “We do analysis on games and training. It is different from before but we are all going in the right direction and enjoying it. He added: “We never used to do it before but from his first game we have worn the GPS (tracking system) and I think the distances and speeds are up. “There are stats everywhere, you see it more and more in the game now. “It is good. They do a lot of stats stuff in American sports and people even get signed on their stats. “It can be a major part of the game and it shows how much the game has moved forward. “I don’t think we are trying harder. Training is different, a lot of tactical stuff and shape and working on individual stuff. Hibs held second-placed Rangers to a goalless draw in Leith on December 19 before they fought out a 1-1 draw at Ibrox on Boxing Day. Stevenson said: “The last time Rangers came here it was probably the best performance a team has put in at Easter Road (since both clubs came back to the Premiership). “They are organised, they have an attacking threat, they have a lot of players on form as well. “I was very impressed and we were probably lucky to get the draw. “It was probably the opposite when we went to Ibrox later on.